Every now and then I get an e-mail of pure goodness. The kind I go back and read over and over again. I feel this sort of calm and joy knowing people like this live and breathe in the world, and I feel so honored to know them, even if it’s only through a computer screen. Meet Chris and then go read what she and her family decided to do on a cold winter day. After all of this enchantment, you can read her adventures of traveling across North America. Isn’t she the coolest? 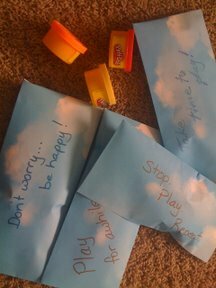 and it doesn’t end…the lovely Jessica of A Parent in Silver Spring decided to join her friend Becky (a password protected blog or I would share) and her Kindness Challenge. And then a whole bunch of other people jumped in and well, these things just make my heart swell. AND, I know, there’s more…I have an invitation for you, but you must wait until tomorrow. I know, I know…but kindness lives on until then.